KINGSTON, R.I. — After more than 10 years of research, scientists at the University of Rhode Island’s Biocontrol Laboratory have released a species of moth collected from Ukraine to help control invasive black and pale swallow-worts. Swallow-worts are invasive vines native to Europe that were introduced into North America in the 19th century, and quickly spread along the East Coast and into Canada. Not only do they outcompete native species and alter soil chemistry, but they harm Monarch butterfly populations. Because swallow-wort is so closely related to milkweed, Monarch butterflies lay their eggs on swallow-wort leaves, but when the eggs hatch the larvae are unable to survive on the plant. “Swallow-wort was one of those weeds becoming increasingly problematic,” said Aaron Weed, of Tunbridge, Vt., a former Ph.D. student at URI who spearheaded the project. Back in 2005 when Weed started his research as a URI graduate student, there was increasing interest in controlling swallow-worts. Since then, he’s seen the vine spread aggressively. It thrives in several different environments, including pastures, forests, and urban spaces. A Hypena opulenta caterpillar in the lab. 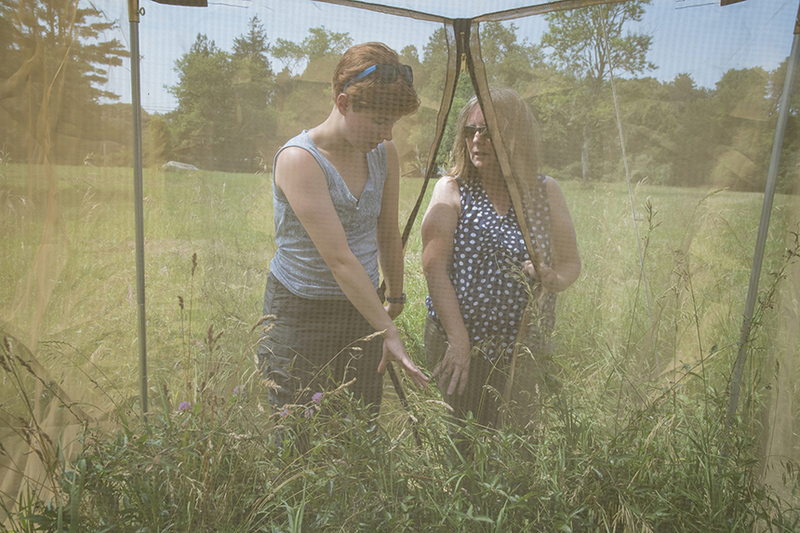 Weed traveled to Europe to try and find natural enemies of swallow-worts and brought back several insect species to test at URI’s Biocontrol Lab. Among them was the Hypena opulenta, a small moth collected from southeastern Ukraine, that the lab found feeds exclusively on swallow-wort species. Weed worked with Lisa Tewksbury, URI’s Biocontrol Lab manager, and Richard Casagrande, professor emeritus of entomology at URI, to conduct years of research on the biology of Hypena opulenta and its impact on swallow-worts. URI received the permit to release the moths in 2017, and field tests in controlled cages were conducted in Charlestown, R.I., and in Massachusetts last year. Tewksbury has been monitoring the releases, and if they’re successful, she said the lab plans to work with other local agencies to share resources and release the moths in other areas. Tewksbury’s lab found the first moth that emerged in June, but hasn’t seen any others yet emerge. Tewksbury hypothesized that Rhode Island’s unusually cool temperatures throughout June may have delayed the moths’ emergence. She also noted that this is the first time that we’re seeing the emergence of this species in New England. Continued research is underway to assess how well this insect will control populations across New England.